We first saw the appellation, “24M” four years ago in our report on research done at MIT to produce an ionic liquid called “Cambridge Crude,” usable in flow batteries. Dr. Yet-Ming Chiang headed up that work in collaboration with Professors Angela Belcher and Paula Hammond at MIT and Glenn Amatucci at Rutgers, among others. They formed a commercial spinoff and seemingly went underground for the next four years. Dr. Chiang and his associates had previously gone commercial with A123, which went through the trial of bankruptcy and being acquired by overseas investors. It’s now solvent and looking to double output. 24M is a spin-off of A123. We found that Professor Chiang had resurfaced when friend and blog reader Marshall Houston sent an article from Quartz about Chiang’s work with Dr. W. Craig Carter to expand on the foundational energy storage technology of 24M – based on the thick black electrolyte they’d created and a resulting semisolid electrode. Because the battery has a simpler structure than conventional “jelly-roll” cells, plants can be smaller and less complex with fewer manufacturing steps. According to 24M, their facilities require about one-tenth the investment of a conventional plant and occupy much less real estate. 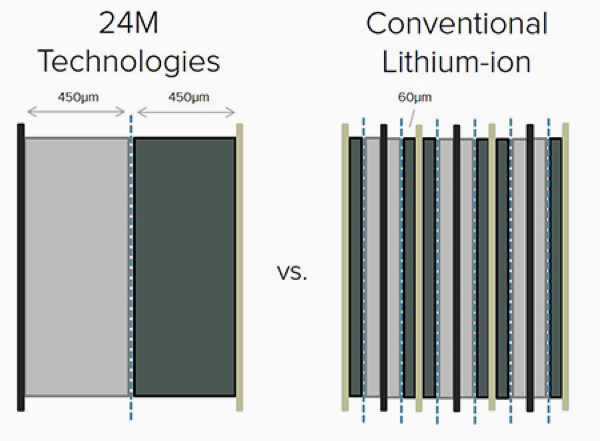 Throop Wilder, 24M’s CEO, explains, “Together, our inventions achieve what lithium-ion has yet to do—meet the ultra-low cost targets of the grid and transportation industries. By 2020 our battery costs will be less than $100 a kilowatt-hour (kWh). We’re emerging at the right time with the right technology.” The cost per kWh competes with Elon Musk’s Tesla Gigafactory’s goals for a far smaller investment than the $5 billion projected for that project. One factor gave Sony an edge in bringing the original lithium-ion battery to market, their predominance in cassette tapes (remember those?). Once CDs and DVDs took over that market, Sony had a manufacturing base with no particular use anywhere else. But – winding a battery-sized width of material off one of their tape machines and layering it with other materials into concentric circles on a spool gave the lithium-ion battery its distinctive “jelly-roll” internal structure. It was a brilliant transition into a new market, but Dr. Chiang is not all that impressed with the legacy. Dr. Chiang and his team had gone down a rat-hole of their own, following development of their flow battery to its logical end and finding that the material volume required to run an EV, for instance, would be impractical. They realized they needed to start down an entirely new path, and like Sony with their tape-winding machine, found they had a semi-solid goo with promising properties. Talking their fellow workers into starting down this new path was hard enough, but they also had to convince investors who’d poured millions into the flow battery concept that they needed to help fund the new direction. Chiang and Wilder must do a great PowerPoint presentation, because they’re now in a third funding loop, tracking purposely toward their new goal. The team has removed large amounts of materials that do not store energy – 35 percent according to Dr. Chiang. They created a manual assembly line where they could make automobile-battery-sized cells in six minutes, probably at least because of the internal simplicity of the new battery structure. Quartz explains the changes made to improve the new battery and its manufacture. “He started out by whacking out whole parts of the filler. His researchers developed a way to make the electrodes without the glue-like binder. Lithium-ion cells typically contain 14 separate material layers; Chiang simplified them, allowing him to reduce the layers to just five. He reduced the filler to 8% of the battery cell. Finally, he overturned the foundations of lithium-ion manufacturing by figuring out how to dispense entirely with the drying process; instead, he would inject the wet electrolyte into the cell from the start. All this and getting a proper slurry that took less drying time makes it possible to “spit out” the new batteries in a production-like manner. If the group can turn up productivity and lower cell cost to $100 per kWh, competitive with gasoline-powered vehicles, the batteries could be a huge success. 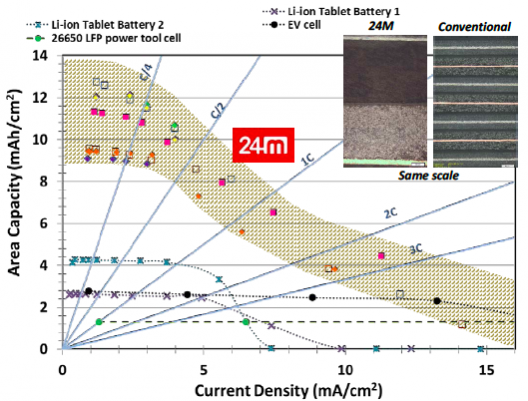 Interviews and corporate materials don’t highlight battery performance, but rather cost. 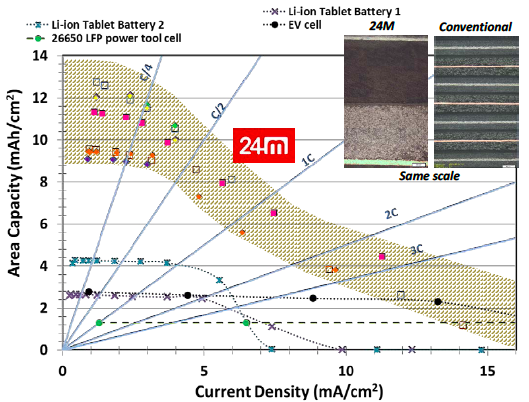 If these new, simplified and cheaper batteries can perform well, Dr. Chiang, Wilder and team may have a winner, and a model of where future batteries may aspire.